Carol moved to Clearwater, Florida, in high school. Carol is a smart and enterprising woman with a great sense of humor. She got a job at Innesbruck, a resort in Tarpon Springs near Tampa, FL. Eventually she managed the Club House. Later, she opened all their clubs and even got involved with their bookkeeping. When Ben first met her while vacationing at the resort, he thought she owned the place. Her first opera was a Florida Grand Opera production of Tales of Hoffman, which she attended with long time friends, Janet and Jim Wolfe. When Janet invited her, she said, “That sounds like fun. But let’s just tell Ben that we’re going to the theater.” They both loved it and became life long fans. When asked what is her favorite opera, Carol responds, “The last one!” When pressed, she might admit that her favorite is probably Carmen. Carol has a long history of generous support for Florida Grand Opera. Together with Ben, she sponsored the Fort Lauderdale performances of Cosí fan tutte, Il barbiere di Siviglia, Boris Godunov, Le nozze di Figaro, Turandot, Die Zauberflöte, Carmen, Die Entführung aus dem Serail, and Madama Butterfly. 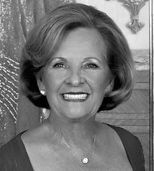 Currently she is president of Harrison Industries, trustee of the First Presbyterian Church of Fort Lauderdale, and trustee of The Royal Dames. She has been an officer and served on the board of the Ben F. Harrison Foundation, a charitable organization founded in 1977. The foundation supports many of the Harrison family’s favorite causes, including Florida Grand Opera, Henderson Mental Health Center, the University of Miami Miller School of Medicine’s Forum on Women’s Health, Symphony of the Americas, the Broward County Library, and her church. She has also served as president of Harrison Investments. Carol has served on the board of The Opera Society for many years and has been honored as a Diva. It is with great pride that she is the Grand Diva today. Carol has two children, Scott and Becky, both of Fort Lauderdale, two step children, ten grandchildren, and an adorable Yorkshire Terrier, Gucci.